The Ultima III Encore CD-ROM Game Manual is on the Ultima Web Archive. An Ultima 3 Manual can be found at LairWare's Ultima 3. Not exactly documentation but similar, there is a list of other commands used in the game, on the Other Codex (Internet Archive). There is Ultima III music on the music page in Auric's Ultima Moongates. All the Ultima III music is on the Bard's Library. A list of prices is on the Other Codex (Internet Archive). 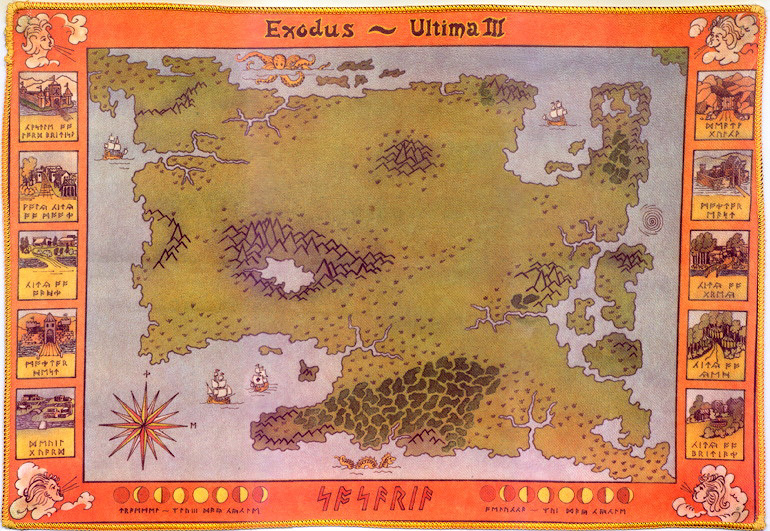 There are excellent Ultima III maps of the world and of the city of Grey on the Ultimatrix Homepage, taken with Ultimatrix. UltimaInfo has a page called Ultima 3: The Lay of the Land (Internet Archive), which has annotated digital maps of just about everything (including Sosaria, Ambrosia, the two castles and the ten towns). Enlightenment Dragon created a copy of the Ultima 3 world map using the Ultima 5 tileset in Excel. You can find this map below, and it is also mirrored at The Ultima Codex. Auric's Ultima Moongates hosts an old advertisement scanned by Auric from an old gaming magazine. Helen Garriott's original and unused concept art for the Ultima 3 box was released at The Ultima Codex. See the news entry about it, or read more and download the art from its Origin Gallery entry. The Ultima Codex released a picture of some early handwritten Assembly language source code for Ultima 3. Check out the news about it or the Origin Gallery entry. LairWare's Ultima 3 is a "modern Macintosh update" of Ultima 3. It is shareware in the sense that it's free but it costs $5 to unlock Ambrosia, which is required to finish the game. Gargish Dragon's Ultima Page has the Ultima 3 Roster file format, courtesy of Sam Glasby. Marc Winterrowd hosts, among his Ultima Tech Info and Patches, an incomplete but nonetheless detailed description of the Ultima 3 file formats [TXT]. Some Ultima 3 trivia can be found at the Ultima 3 page at the Codex of Ultima Wisdom. The Ultima III Help and Information File by Warlord, on the Ultima Web Archive, gives lots of useful information and what is needed to finish Ultima III. It is also found in TXT format on Auric's Ultima Moongates. There is a better hint file by Leon McNeill, illustrated with pictures to accompany the information. The Other Codex tells you about the cards needed to destroy Exodus (Internet Archive).